The Fashion Bug in Florida: Free Samples of Eucerin Lotion AND Dove Body Wash!! 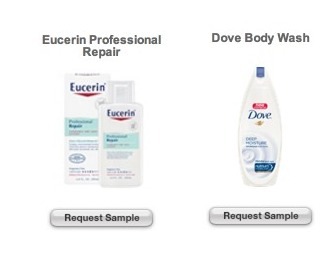 Free Samples of Eucerin Lotion AND Dove Body Wash!! Hey Fashion Bugs, Head over now to score your free samples of Eucerin Lotion and Dove Body Wash from Target! Be sure to click on both samples so you can score 2 freebies! *** After you choose your first sample, you will answer the short survey and then enter your address once that's completed make sure to click where it says's " Search for more samples" then click on the next sample, answer the short survey and your address will still be there from the last one so just click on send me my sample and your done! Be sure to come back share with everyone when you score yours! These really do come, I promise! I just got my free razor yesterday from the last freebies I posted. Did you guys get yours yet? Thanks and good luck!